Medix 5.5 Retinol + Ferulic Acid is a retinol lotion for the face and body that didn’t agree with my skin at all. The texture and feeling of this lotion is super thick and oily, and when you apply it to the skin, it feels like the skin can’t breathe at all. The bottle has a pump applicator that pumps out a lot of product so you’ll only need one pump to cover your entire face, neck, and chest. With the super oily texture of the lotion, the product never really dries down and leaves your skin feeling heavy and gross. One thing I like about this product is the smell; it smells kind of sweet and reminds me of candy. Once you apply it to your skin, the scent goes away very quickly. Short term, I noticed that this lotion was clogging my pores and leaving my face feeling and looking super congested. After using this lotion for a longer period of time, my skin became super broken out and irritated. Not only didn’t it break out my skin, it also didn’t help with fine lines and wrinkles at all. This really didn’t do anything for my skin. Overall, I really didn’t like Medix 5.5 Retinol + Ferulic Acid and I wouldn’t recommend this lotion to anyone with sensitive or oily skin because of the texture of this lotion. The texture of Medix 5.5 Retinol + Ferulic Acid is a very thick and oily lotion that kind of feels like it’s suffocating your skin. Medix 5.5 Retinol + Ferulic Acid comes in a very large bottle with a pump applicator. The pump is quite long so it pumps out a ton of product. You definitely only need one pump to cover your entire face, neck, and chest and you still have a lot of product left. Medix 5.5 Retinol + Ferulic Acid never totally dries down and continues to feel very oily, but after about a minute, it dries down a bit. The smell of Medix 5.5 Retinol + Ferulic Acid smells pretty good; it has a subtle, sweet scent that smells a bit like candy. 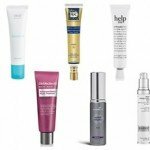 The smell wears off pretty quickly after you apply it to your skin. After using Medix 5.5 Retinol + Ferulic Acid, I started to notice that my skin was becoming irritated and my pores were getting clogged. Over a longer period of time using Medix 5.5 Retinol + Ferulic Acid, my skin was badly breaking out and my skin was highly congested. I had deep breakouts around my cheeks and along my forehead. This definitely didn’t agree with my skin at all. Not only did it make me breakout, but I didn’t see any difference to my fine lines and wrinkles at all. Medix 5.5 Retinol + Ferulic Acid has some interesting ingredients and it is cruelty free and vegan which I can really appreciate. A few of the interesting ingredients are shea butter, aloe vera, and ferulic acid. Shea butter can be good for anti-aging purposes because it helps hydrate the skin and locks in moisture which can help to plump up the skin and fine lines on the face. Aloe very is a great ingredient to help with fine line and wrinkles because it can help rebuild collagen and heal the skin. Ferulic acid is great for adding antioxidants to the skin which helps with fighting free radicals from damaging the skin. 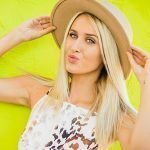 These three ingredients are very interesting and when used together could be great for helping with fine lines and wrinkles. The cost of Medix 5.5 Retinol + Ferulic Acid is $30.00 for 15 oz of product, which comes out to $2.00 an oz. 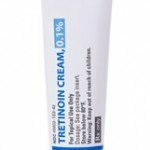 This is a very inexpensive price for a retinol lotion. Unfortunately, I couldn’t find a money back guarantee for Medix 5.5 Retinol + Ferulic Acid. 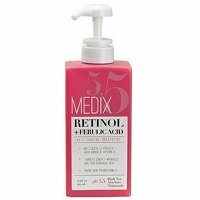 To buy Medix 5.5 Retinol + Ferulic Acid, click here. Ingredients Ferulic acid helps boost antioxidants in the skin.